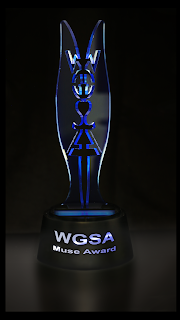 Now in its third year, the WGSA Muse Awards took place on Saturday night, 2 April 2016, at a glamorous and star-studded event at the Soweto Theatre in Jabulani, Soweto. 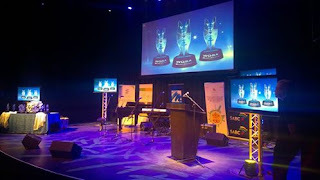 It was attended by leading figures and industry insiders in the South African film and television industry, as well as representatives from headline sponsors, MNET, gold sponsors SABC and NFVF, and our award sponsor, Gauteng Film Commission. The audience was entertained by Bongani Drama Nomcweya joking about overcoming writer’s block. The entertainment of the evening was the talented duo, Lizanne Breedt and Donnavan Von Der Vaylle, singer and poet, Jessica Mbangeni and her band, and the legendary, Don Laka. A special service award went to the WGSA Muse Awards creator Harriet Meier in acknowledgement of her outstanding service to the WGSA. WGSA would like to thank all the Muse Awards sponsors for making the ceremony possible and for contributing to the winners’ prizes (estimated at around R10,000 each). Our other sponsors: Accolade Wine, eAcademy and Barefoot Media, Franz Gräbe Flower Couture, Exclusive Books, Oageng Multimedia, Olmog’s Bathroom Essentials, and Veronica Stewart. We also wish to thank Selimathunzi for their presence.